Editorial Board: Cherevko O.V., Doctor of Economic Sciences, prof. (Editor in Chief); Boechko F.F. Corresponding Member of the National Academy of Pedagogical Sciences of Ukraine, Doctor of Biological Sciences, prof. (deputy editor); Kornovenko S.V. Doctor of Historical Sciences, prof. (deputy editor); Kyryliuk Ye.M. Doctor of Economic Sciences, prof. (executive secretary); Arkhipova S.P. Doctor of Pedagogical Sciences, prof.; Bida O.A. Doctor of Pedagogical Sciences, prof.; Gnezdilova K.M. Doctor of Pedagogical Sciences, prof.; Golovnya B.P. Doctor of Technical Sciences, associate prof.; Husak A.M. Doctor of Physical and Mathematical Sciences, prof.; Desyatov T.M., Doctor of Pedagogical Sciences, prof.; Zemzyulina N.I. Doctor of Historical Sciences, prof.; Zhabotinskaya S.A., Doctor of Philology, prof.; Kuzminsky A.I. Corresponding Member of the National Academy of Pedagogical Sciences of Ukraine, Doctor of Pedagogical Sciences, prof.; Kukurudza I.I. Doctor of Economic Sciences, prof.; Lyzogub V.S., Doctor of Biological Sciences, prof.; Lyashenko Yu.O., Doctor of Physical and Mathematical Sciences, associate prof.; Marchenko O.V., Doctor of Philosophy, prof.; Masnenko V.V. 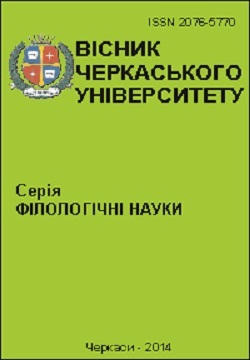 Doctor of Historical Sciences, prof.; Minayev B.P. Doctor of Chemistry, prof.; Morozov A.G. Doctor of Historical Sciences, prof.; Perekhrest O.H., Doctor of Historical Sciences, prof.; Polishchuk V.T. Doctor of Philology, prof.; Selivanova O.O., Doctor of Philology, prof.; Chaban A.Yu., Doctor of Historical Sciences, prof.; Shpak V.P. Doctor of Pedagogical Sciences, prof.
Editorial Board of the Philological Sciences Series: Selivanova O.O., Doctor of Philological Sciences, Professor (executive editor of the Linguistics area); Kalko V.V., Candidate of Philological Sciences, Assistant Professor (executive secretary of the Linguistics area); Polishchuk V.T., Doctor of Philological Sciences, Professor (executive editor of the Literary Criticism area); Koretska M.V., Candidate of Philological Sciences (executive secretary of the Literary Criticism area); Baranov A., Doctor of Philological Sciences, Professor (Lithuania); Bogdanovich G.Yu., Doctor of Philological Sciences, Professor; Velyvchenko V.F., Doctor of Philological Sciences, Professor; Gudmanyan A.G., Doctor of Philological Sciences, Professor; Donchik V.G., Academician of the National Academy of Sciences of Ukraine, Doctor of Philological Sciences, Professor; Zhabotinskaya S.A., Doctor of Philological Sciences, Professor; Kavun L.I., Doctor of Philological Sciences, Professor; Kalko M.I., Doctor of Philological Sciences, Professor; Kichenko O.S., Doctor of Philological Sciences, Professor; Kovalevska T.Yu., Doctor of Philological Sciences, Professor; Kravchenko N.K., Doctor of Philological Sciences, Professor; Lassan Ye.R., Doctor of Philological Sciences, Professor (Estonia); Litvin I.M., Candidate of Philological Sciences, Assistant Professor; Limborsky I.V., Doctor of Philological Sciences, Professor; Martynova G.I., Doctor of Philological Sciences, Professor; Naenko M.K., Doctor of Philological Sciences, Professor; Ozerova N.G., Doctor of Philological Sciences, Professor; Panchenko V.E., Doctor of Philological Sciences, Professor; Paharenko V.I., Doctor of Philological Sciences, Professor; Pashis L.O., Candidate of Philological Sciences, Assistant Professor; Prykhodko A.M., Doctor of Philological Sciences, Professor; Romashchenko L.I., Doctor of Philological Sciences, Professor; Sobol V.O., Doctor of Philological Sciences, Professor (Poland); Chizhmarova M., Candidate of Philological Sciences, Assistant Professor (Slovakia).